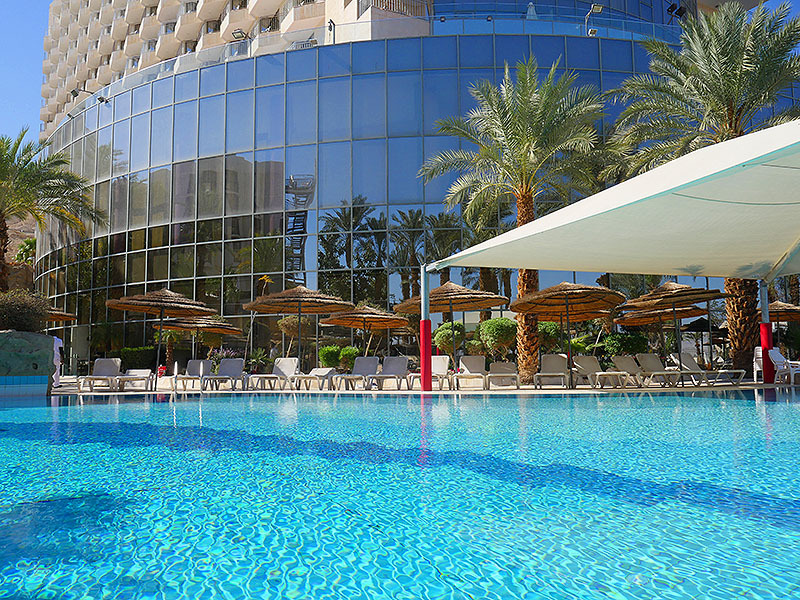 With its modern, sleek design, Royal Dead Sea gleams in the Judean Desert sun. From here you can easily walk to the beach and bathe in the salty waters of the Dead Sea. For nature and history lovers, Masada and Ein Bokek Nature Reserve are short drive away. 400 spacious guest rooms, luxurious suites, and family accommodations allow you to reach new heights of relaxation at the lowest place on earth. 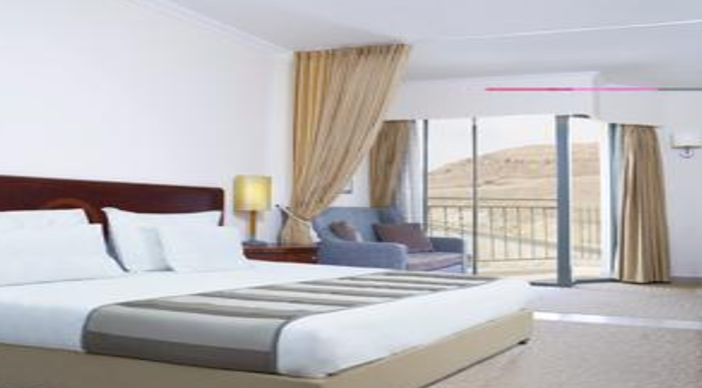 Spectacular views of the Dead Sea, the Judean Desert, and the Moab Mountains all make up for an unforgettable stay. 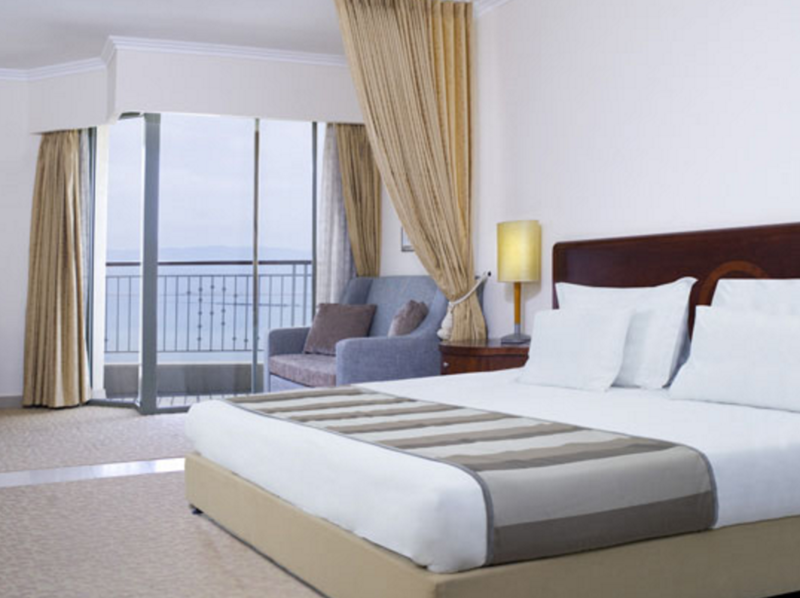 All rooms are well equipped with air conditioning, minibar, safe and more, to ensure the utmost comfort during your stay. Royal Dead Sea is home to one of the largest and most spectacular health clubs in the Middle East. With over 50 different treatments, the hotel is perfectly suited for a pampering spa getaway. The hotel's extensive conference facilities and state-of-art equipment make for the perfect mix of business and pleasure. Hotel guests are treated to a beach, complete with sunloungers, parasols, towels and transport to-and-from the hotel. 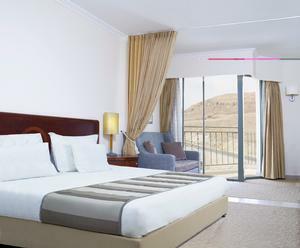 Enjoy Royal Dead Sea's hospitality with free access to hotel's health center and rooftop solarium, or treat yourself to the luxury of the hotel's brand new VIP lounge. For an order not canceled up to 48 hours, the customer will be charged a one-night cancellation fee. In July, August and holidays, for an order not canceled up to 5 days prior to arrival, the customer will be charged a one-night cancellation fee. dlxsuiteDlx suite, bath room with shower, safe, Fridge, coffe set. 2 rooms with seperation, balcony facing Dead sea. DlxPVpool and sea view, safe, Twin bed, fridge hair dryier, bath roon and shower, 39 m.
Family roomLarge spacious room with modern design, with a large balcony facing the mountains of the desert. Is suitable for two children. Double room can be separated, sofa bed, and bath. It also includes a room safe, coffee maker, flat-screen 32-inch LCD TV and cable, air conditioning with individual control, minibar, hair dryer, and a phone with voice mail. 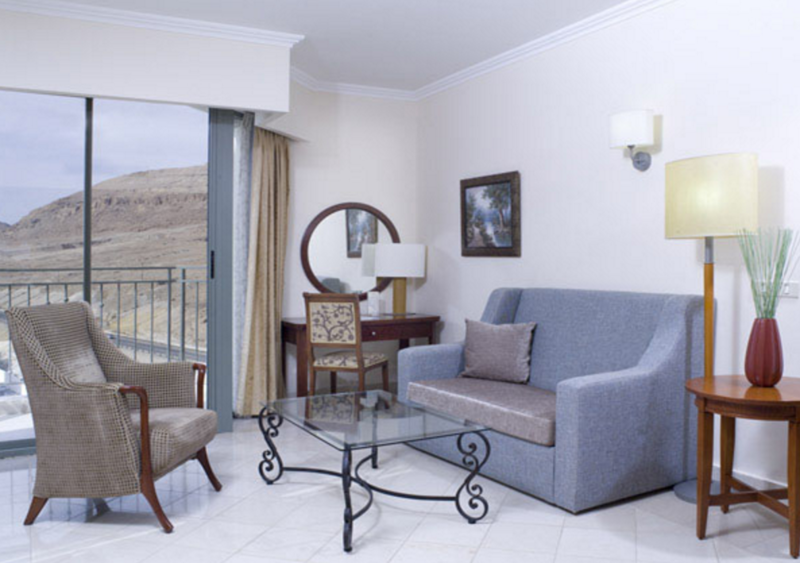 Mountain View Family RoomLarge spacious room with modern design, with a large balcony facing the mountains of the desert. Is suitable for two children. Double room can be separated, sofa bed, and bath. It also includes a room safe, coffee maker, flat-screen 32-inch LCD TV and cable, air conditioning with individual control, minibar, hair dryer, and a phone with voice mail. 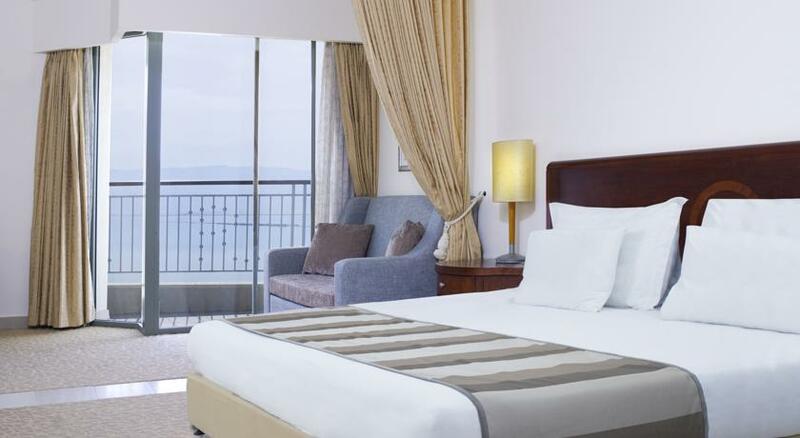 Panorama RoomExtra spacious, modern design, panoramic windows with full view of the sea, without a balcony. Is suitable for two children + baby. Double bed and sofa bed, and bath. It also includes a room safe, coffee maker, flat-screen 32-inch LCD TV and cable, air conditioning with individual control, minibar, hair dryer, and a phone with voice mail. Deluxe Room with facing the sea or poolRooms facing the sea and pool, safe bathtub and shower, King size double bed, 39 sq.m. 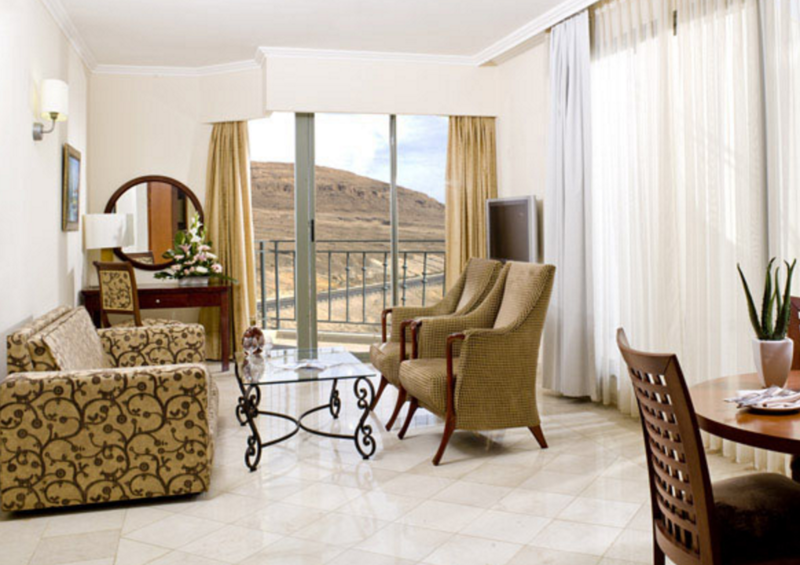 Deluxe Room with mountain viewModern design room with a large balcony facing the mountains of the desert. Is suitable for two children. Double bed and a sofa bed with possibility of separation by a curtain and bath. It also includes a room safe, coffee maker, flat-screen 32-inch LCD TV and cable, air conditioning with individual control, minibar, hair dryer, and a phone with voice mail. Royal SuiteRoyal suite guests enjoy free admission to the spa VIP and VIP Lounge Royal suite accommodation and spectacular giant. The suite includes: Lobby broad, dining room, large living room, rich furnishings, luxurious bedroom includes luxurious linens and decorative pillows, huge bathroom includes a bath, shower, toilet. Two large LCD TV sets, personal kitchenette, an espresso machine, a docking station for iPhone / iPad. Suite huge terrace (40 sqm) and private sunbathing West Another bedroom balcony. Hotel guests staying in the suite of this kind will be given during their free bathrobes. Suites Accommodates a maximum of three adults or a couple + 2 children and a baby. Deluxe SuiteDeluxe suite guests enjoy free admission to the spa VIP and VIP Lounge Luxurious suite consisting of a bedroom and decorative pillows upgraded luxurious bedding, spacious living room includes Desk luxurious, two LCD TVs and a sofa bed for sleeping children. Large bathroom suite includes a wide shower, bath and toilet. All suites are equipped with a minibar (empty), a personal safe, desk, air conditioning, coffee maker, cable TV, hair dryer luggage facility and voice mail details. Suite 2 balconies of which go to the living room which is furnished with garden furniture for guests to use, and one which is going to her bedroom. Facing balconies overlooking the pool and the Dead Sea. Hotel guests staying in the suite of this kind will be given during their free bathrobes. Suites Accommodates a maximum of three adults or a couple + 2 children and a baby. Panorama RoomVery spacious bedroom with a seating area special structure of the full panoramic window view sea salt (without balcony). Bathroom (no shower). All rooms are equipped with a minibar (empty), a personal safe, desk, air conditioning, coffee maker, LCD TV, cable TV, hair dryer luggage facility and voice mail details. The rooms are suitable for a maximum occupancy of three adults, or a couple + 2 children + baby. 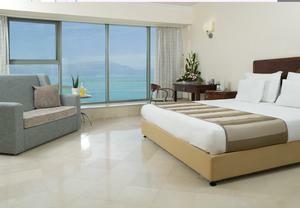 Deluxe room facing the poolModern design room with a large balcony facing the Dead Sea or the hotel pool. Is suitable for two children. Double bed and a sofa bed with possibility of separation by a curtain and bath. It also includes a room safe, coffee maker, flat-screen 32-inch LCD TV and cable, air conditioning with individual control, minibar, hair dryer, and a phone with voice mail. Double room with no viewSmall rooms with no view suitable for couples only. Each king-size bed, a bathroom (no shower) These rooms have a shared balcony with the room next to the partition. All rooms are equipped with a minibar (empty), a personal safe, desk, air conditioning, coffee maker, LCD TV, cable TV, hair dryer luggage facility and voice mail details. A discounted room rate due to limited room view and location. Located in the main hallway corridors separate guest floors. Rooms are suitable for couples only. Deluxe Room Mountain ViewRegular room with a sofa bed for children. There is room curtain that can be used to separate parents and children. Bathroom (bathtub and shower) and toilet. These rooms there is a balcony with mountain and sea salt. Families with children can book a room of this type with a connecting door (advance reservation and for an additional fee). All rooms are equipped with a minibar (empty), a personal safe, desk, air conditioning, coffee maker, LCD TV, cable TV, hair dryer luggage facility and voice mail details. The rooms are suitable for a maximum occupancy of three adults, or a couple + 2 children.